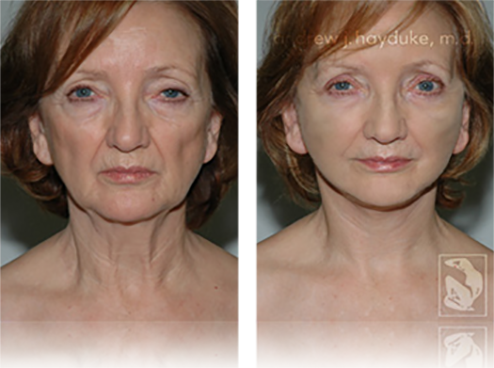 Facelift, necklift and lower eyelids. 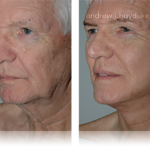 Note the improvement in the neck and refinement of the jawline. 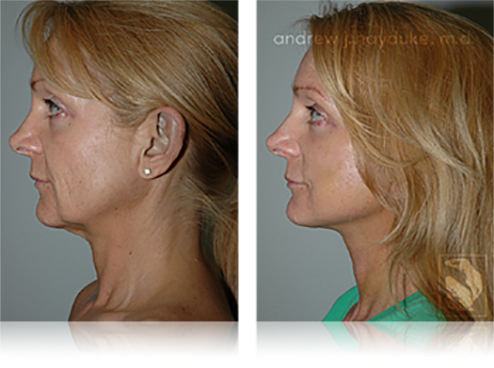 Also notice the vertical volume shift in the cheek area (cheek implants were not used). 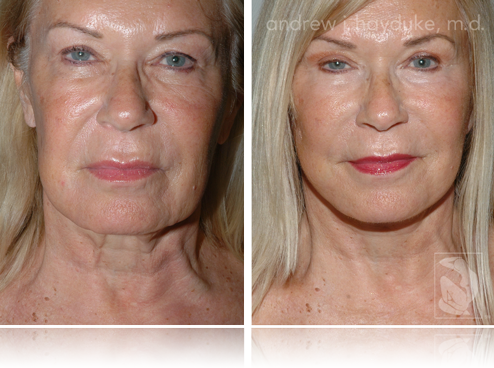 This client exhibited early signs of facial aging and achieved an elegant and tasteful rejuvenation. Downward gaze pose. 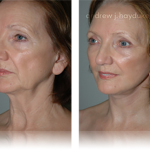 Faceflit, necklift and lower eyelids. 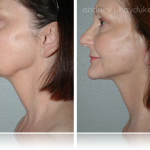 Note the improvement in the neck and refinement of the jawline. 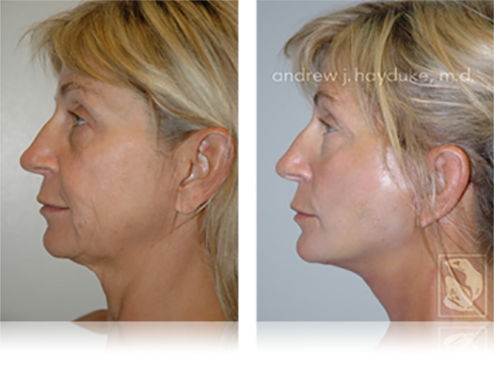 Also notice the vertical volume shift in the cheek area (cheek implants were not used). 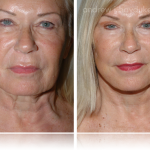 This client exhibited early signs of facial aging and achieved an elegant and tasteful rejuvenation. 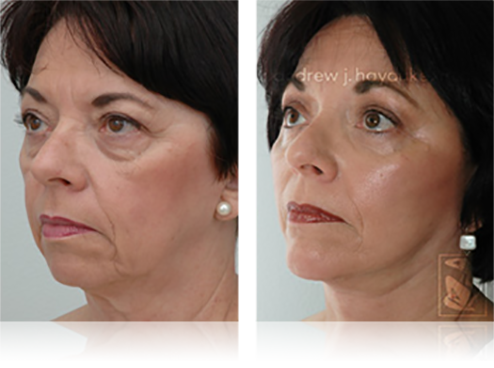 Necklift, facelift, upper eyelid bleph, lower eyelid bleph, and endoscopic browlift with minimal incisions. 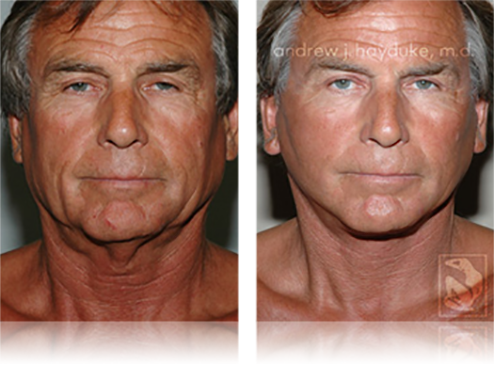 Note the redefined jawline and neck, restoration of midface/cheek volume without using cheek implants, and tasteful eyebrow/forehead elevation. 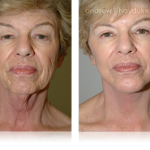 Necklift, facelift, and endoscopic browlift with minimal incisions. Note the refinement of the jawline and neck. 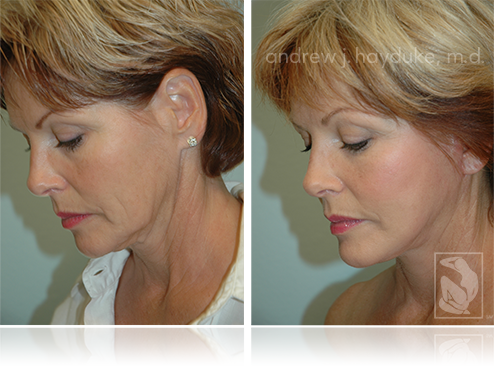 Also notice the pleasing vertical soft tissue elevation of the cheek/midface region (cheek implants were not used). 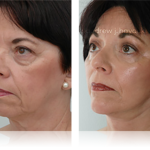 The brow and forehead area was also tastefully rejuvenated. 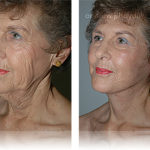 This client commented that even her agent was excited about her refreshed appearance. Downward gaze pose. 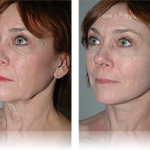 Necklift, facelift, and endoscopic browlift with minimal incisions. 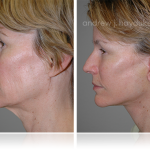 Note the refinement of the jawline and neck. 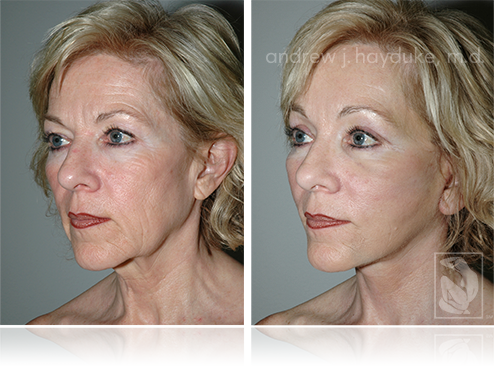 Also notice the pleasing vertical soft tissue elevation of the cheek/midface region (cheek implants were not used). 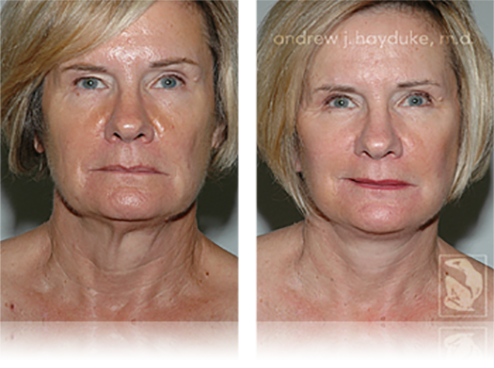 The brow and forehead area was also tastefully rejuvenated. 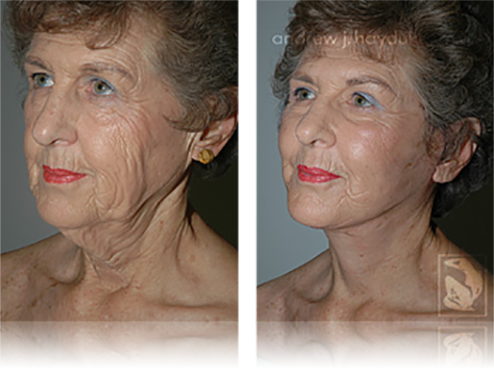 This client commented that even her agent was excited about her refreshed appearance. 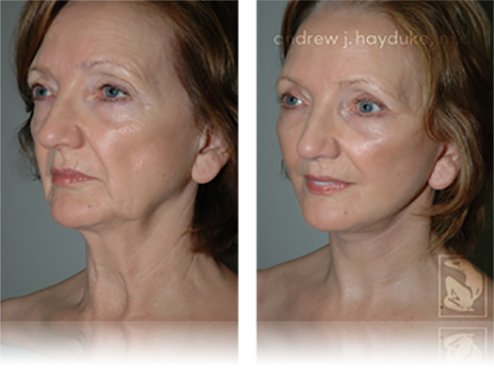 Necklift, facelift, chin implant and upper eyelid blepharoplasty. 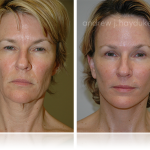 This client presented at a more advanced stage of facial aging. 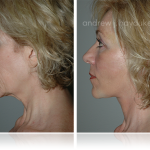 She displayed a dramatic excess of sagging neck tissues and complete lack of definition of her jawline. 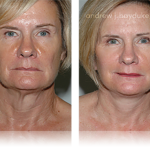 Her situation required a more aggressive approach to achieve appropriate rejuvenation. 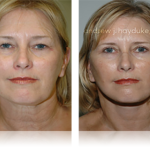 Necklift, facelift, and upper eyelid surgery. 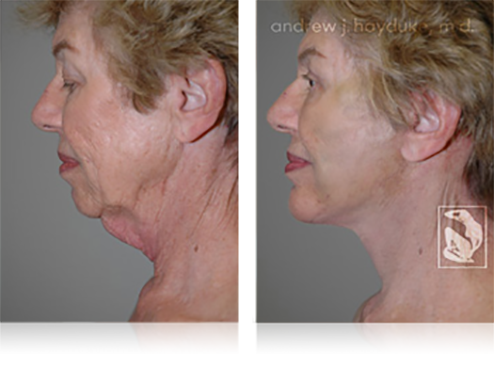 Before surgery, notice the loose "old looking" skin of the front of her neck, moderate jowling, and saggy skin under her chin. 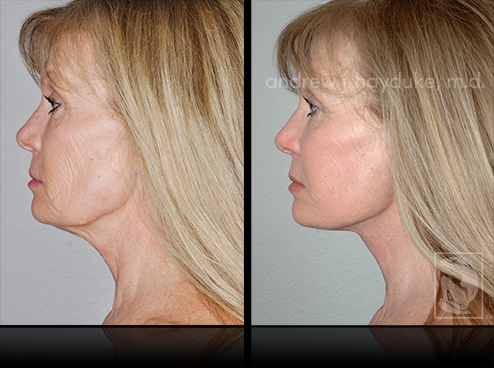 After surgery, the jawline is much better defined and the saggy neck skin appears more youthful. 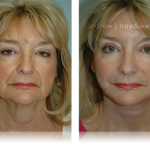 Tasteful vertical soft tissue elevation was achieved in her midface (cheek) region without the use of cheek implants. 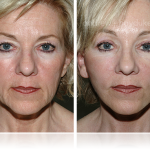 Facelift, necklift and upper eyelid blepharoplasty. 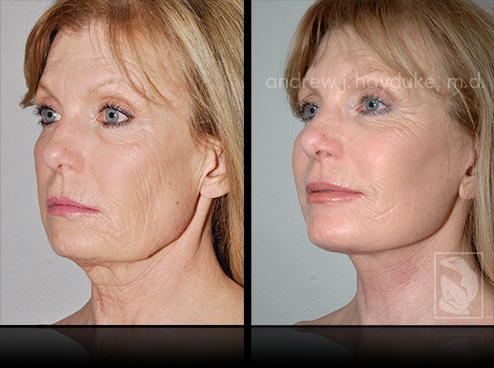 This client's aging changes were most pronounced in her midface, cheek, and jawline. 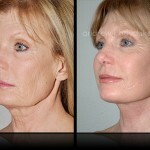 After surgery, notice the significant vertical volume shift in her cheek/midface region (cheek implants were not used). 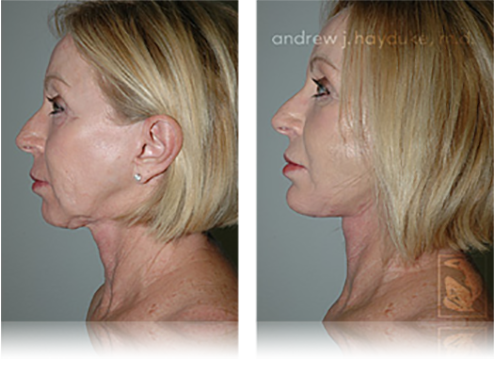 Her jawline was re-defined. 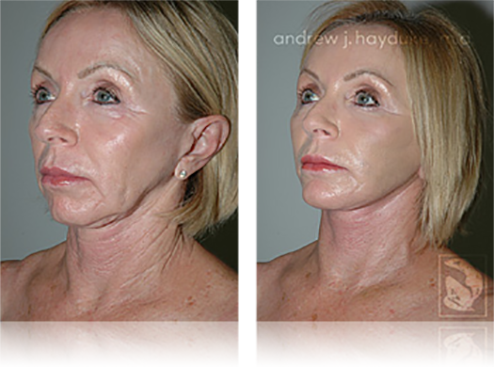 The somewhat "deflated" and tired overall appearance before surgery was transformed into a happier, more youthful look. 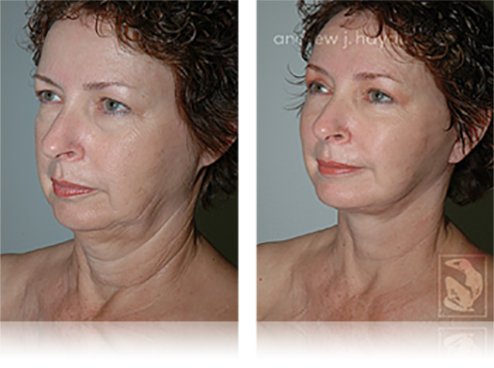 Necklift and facelift. 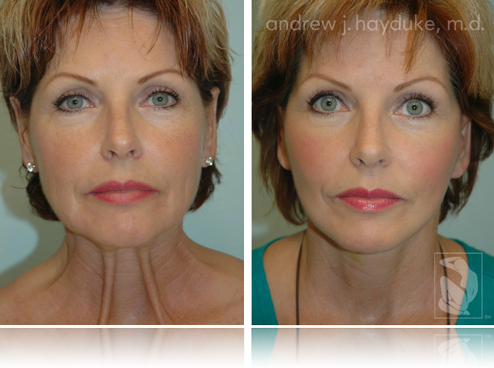 Before surgery, note the deflated (sunken) appearance of the midface/cheek region and jowls. 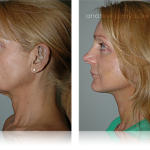 After surgery, the jawline and neck are much better defined (crisper). 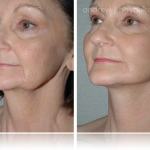 The cheek/midface region was lifted vertically to create a more youthful facial contour. 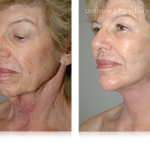 Also notice the improvement in the wrinkles that used to be problematic immediately in front of her ear (known as pretragal wrinkles). 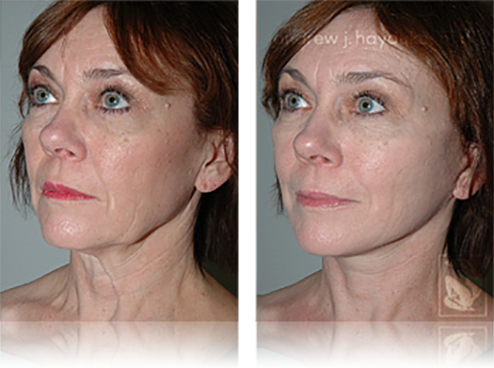 Necklift, facelift, endoscopic browlift, chin implant, lower and upper eyelid bleph. 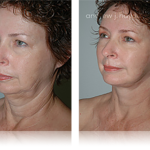 Note the low eyebrows, bulging lower eyelid fat pockets, sunken cheek/midface area, jowls, loose neck skin, and weak unbalanced chin before surgery. 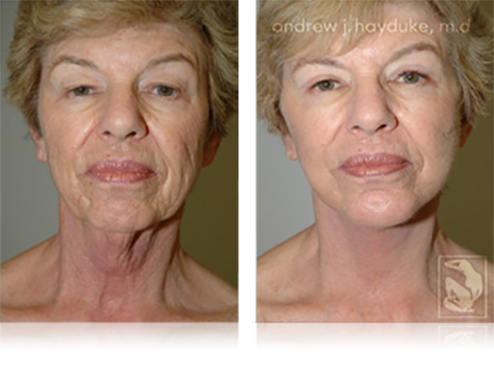 After surgery, she appears significantly younger, more energetic, and less intense. 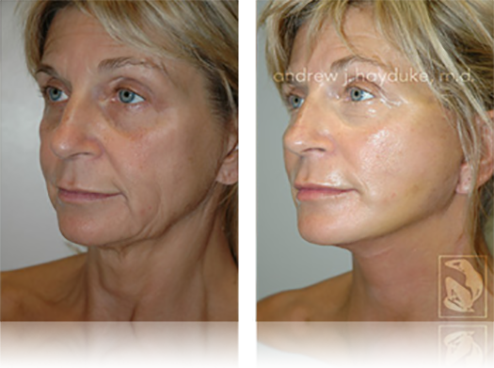 Facelift and upper eyelid bleph. 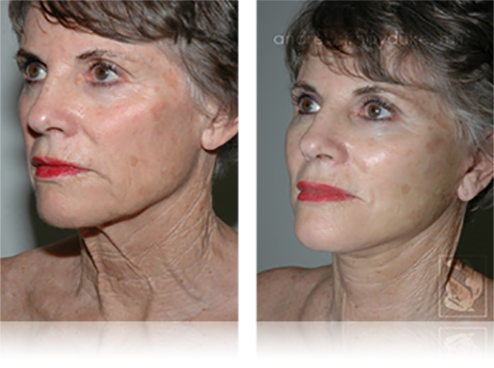 Note the sharper jawline, smoother neck, and more alert appearance of the eyes after surgery. His "masculine look" was clearly preserved and tastefully improved upon. 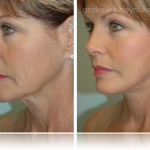 Necklift and facelift. 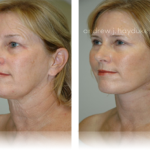 Note the sagging neck skin, jowls, and deflated midface (cheek) area before surgery. 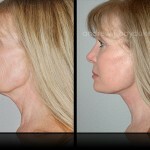 After surgery, the neck and jawline are refined and the client appears youthful and revitalized. 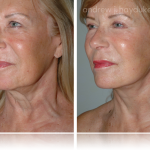 Necklift and facelift. 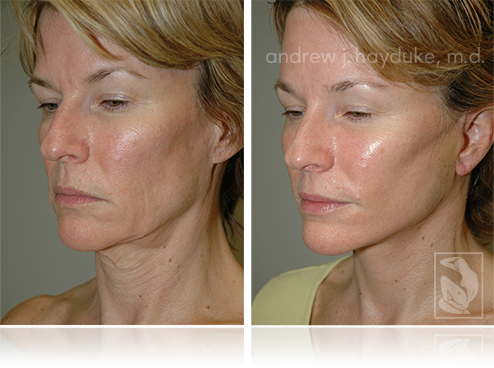 Note the tired and deflated appearance of the cheeks (midface), jawline and neck before surgery. 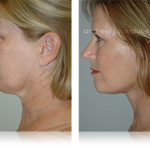 After surgery, the jawline, neck and cheeks (midface) appear more youthful and an overall friendlier and energetic look was achieved. 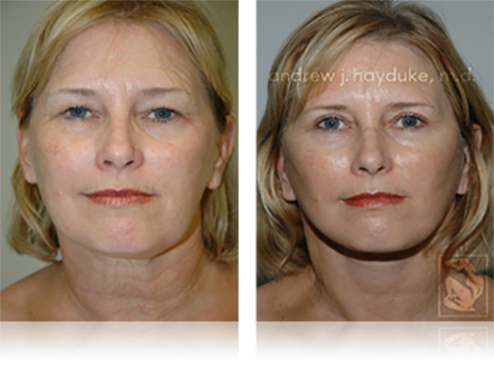 Necklift, facelift, upper and lower blepharoplasty. 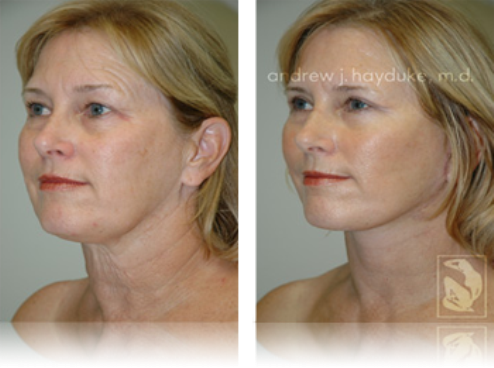 Note the sagging neck tissues, jowls, and deflated cheek area (midface) before surgery. 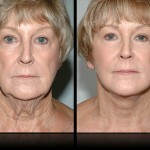 After surgery, she appears more energetic and youthful. 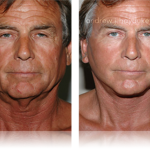 Necklift, facelift, lower bleph and chin implant. 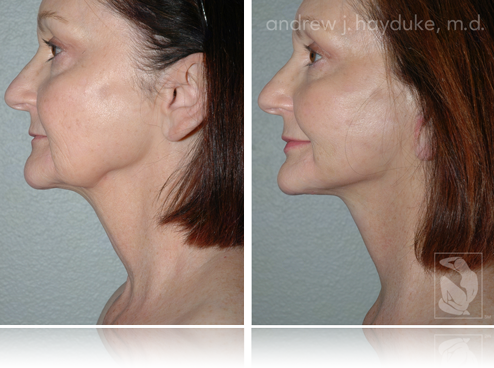 Note the jowling and poorly defined jawline before surgery. 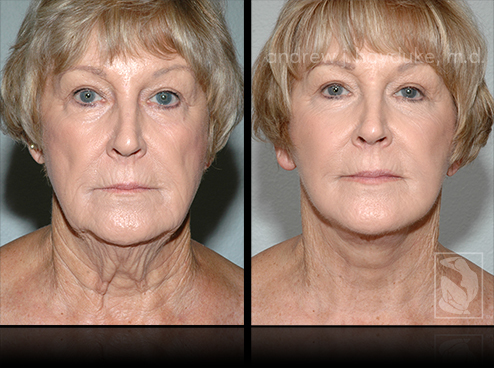 After surgery, note the improvement in the lower third facial balance and the more youthful refreshed look. 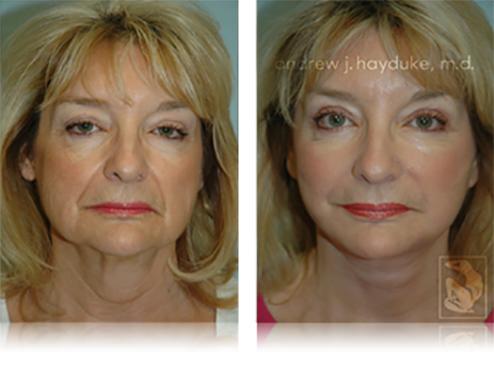 Necklift, facelift, upper and lower eyelid blepharoplasty. 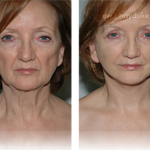 Note the overall refreshed, well rested, and younger appearance after surgery. 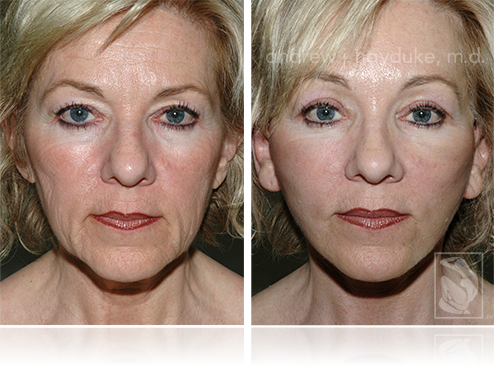 The upper eyelids are much better defined (less intense) and the lower eyelids are less puffy. FFacelift and necklift. 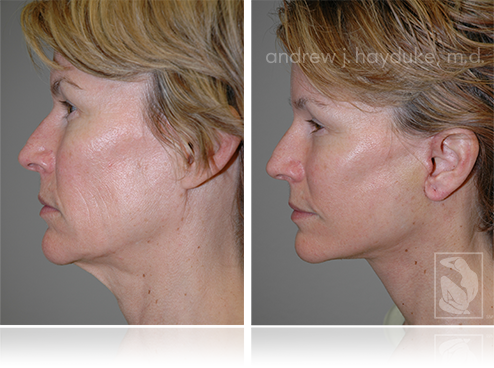 Note the refinement of the jawline and vertical volume shift in the cheek area (cheek implants were not used). 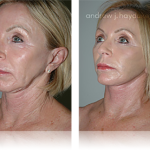 This young client exhibited early signs of facial aging and achieved a tasteful rejuvenation. 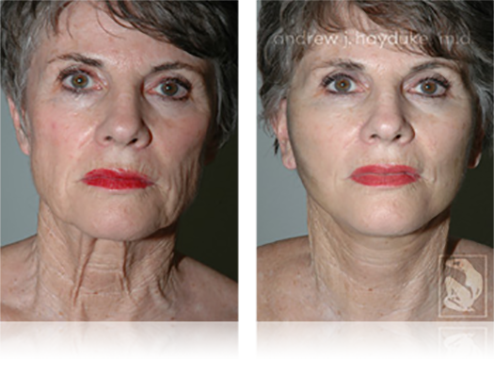 Necklift and facelift. 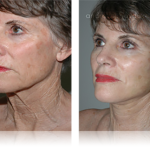 Note the improvement in the neck bands (platysmal bands) and jawline. 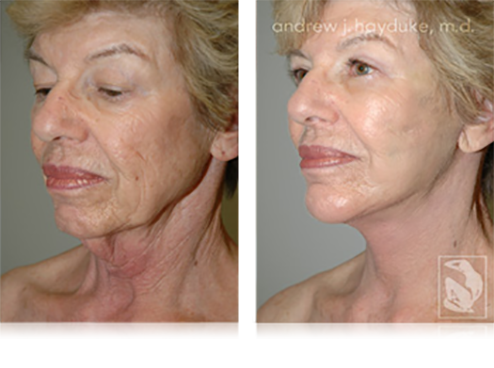 Facelift and necklift. 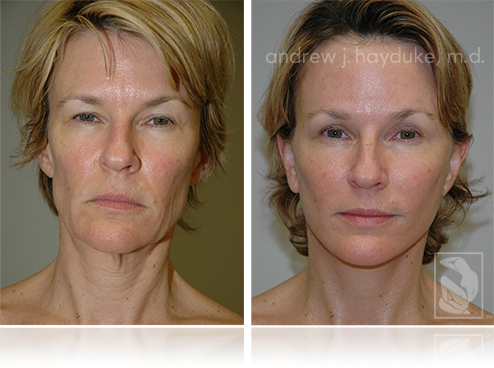 This young client exhibited early signs of facial aging. 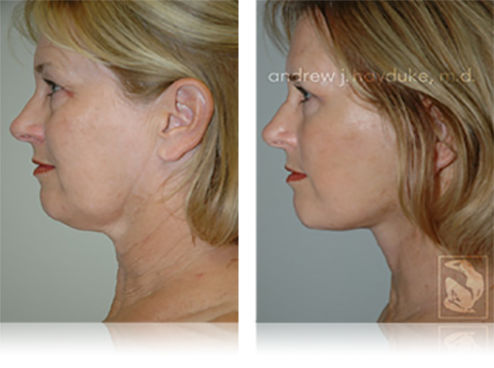 Note the improvement in vertical neck bands, refinement of her jawline, and vertical volume shift of her cheek area. 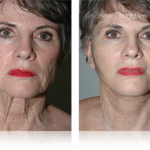 Facelift, necklift, upper and lower bleph. 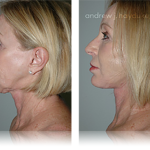 Note refinement of the neck and jawline. Tasteful rejuvenation was achieved. 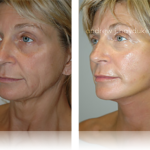 Facelift, necklift and upper eyelid bleph. Note the tasteful improvement in the neck and jawline. 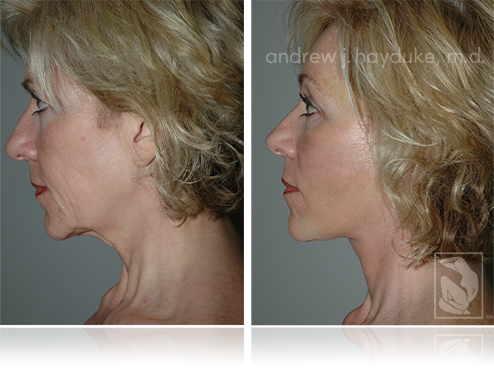 Necklift and facelift. 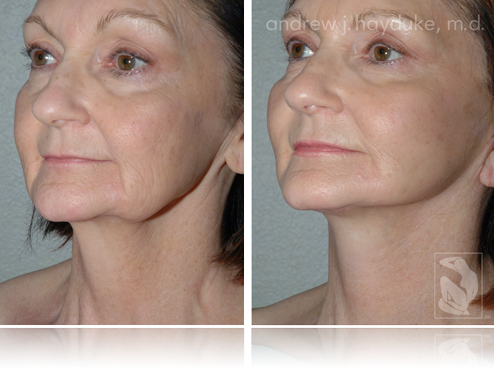 Client requested a very natural looking lift with improvement of her jowl and jawline appearance. Facelift. 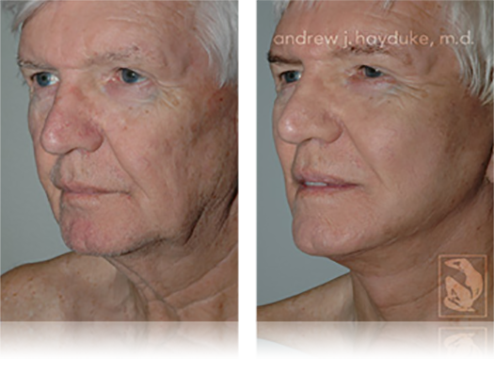 Note the improvement and refinement of the neck and jawline. 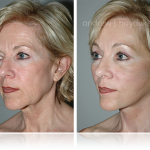 Also notice the vertical volume shift in the cheek area (cheek implants were not used). 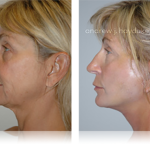 Necklift and facelift. 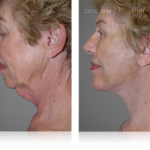 Note the improved appearance of both the front of the neck and jowl regions. 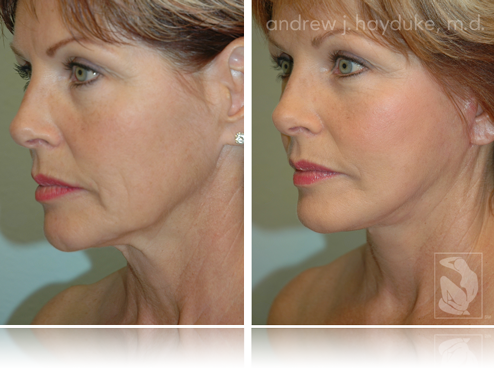 The cheek area also displays a more youthful vertical volume shift after surgery.